April 6, 2014 - The Federal Aviation Administration (FAA) recently issued Jeppesen a letter of operational suitability confirming the form and functionality of iPad mini for use in the cockpit when paired with Jeppesen’s electronic flight bag (EFB) solutions. Jeppesen worked with the FAA Seattle Aircraft Evaluation Group (AEG) to evaluate the usability of Jeppesen charts and enroute map on iPad mini and iPad mini with Retina display. The FAA process was conducted to provide assurance for pilots and aviation operators that Jeppesen data, when displayed on the 7.9-inch iPad mini screen, is fully acceptable for use and interaction in the cockpit. 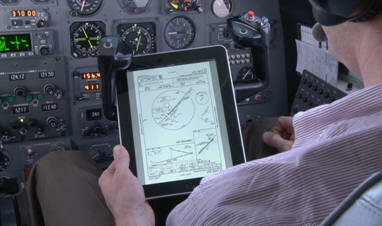 Jeppesen Mobile FliteDeck was used by the FAA to access aviation data on iPad mini during the evaluation process. Positive operational feedback and data from Air Carrier and Business Aviation operators was also received and considered. In the United States, FAR Part 91K, 121, 125, and 135 fractional, commuter, on-demand operators and air carriers are required to gain formal FAA authorization to use EFB solutions in flight. Jeppesen will share copies of the letter to interested customers using iPad mini and affected Jeppesen Apps, for use in their authorization package. “We are pleased with the findings of the FAA evaluation team confirming the use of iPad mini and Jeppesen mobile EFB solutions,” said Tim Huegel, director, Jeppesen Aviation Portfolio Management. “iPad mini and iPad mini with Retina display offer pilots the incredible detail and ease of use they need when leveraging our valuable data-driven apps and flight information in the cockpit. Previously, Jeppesen announced iPad mini with Retina display joined iPad Air as the latest iPad model that passed rapid decompression testing, proving device integrity in the unlikely event of sudden cabin pressure loss. All iPad model families produced to date have successfully passed rapid decompression testing for EFB use. These test results are also available to customers on request as part of an operator’s program to obtain FAA authorization for in-flight use of Jeppesen’s apps on iPad.